As a big city girl, I decided to start our Hawaii trip in Honolulu. 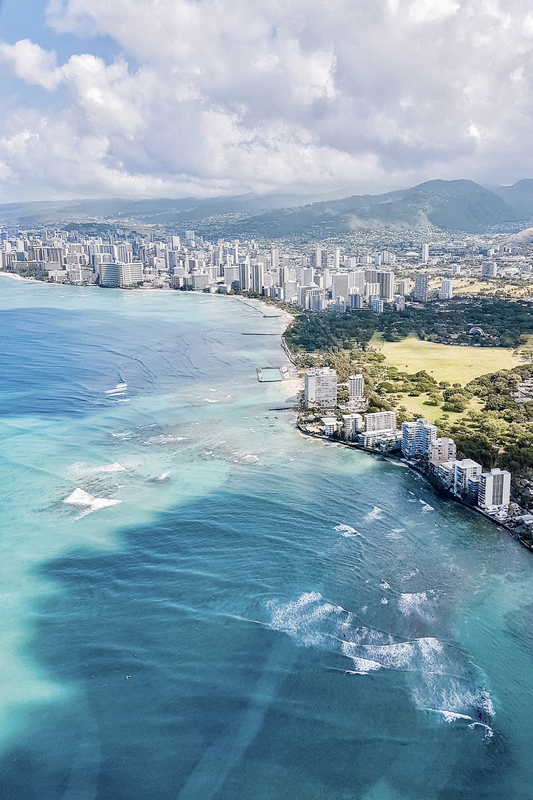 I guess people either love or hate Honolulu because it’s probably not what you normally have in mind when thinking about a Hawaiian getaway. 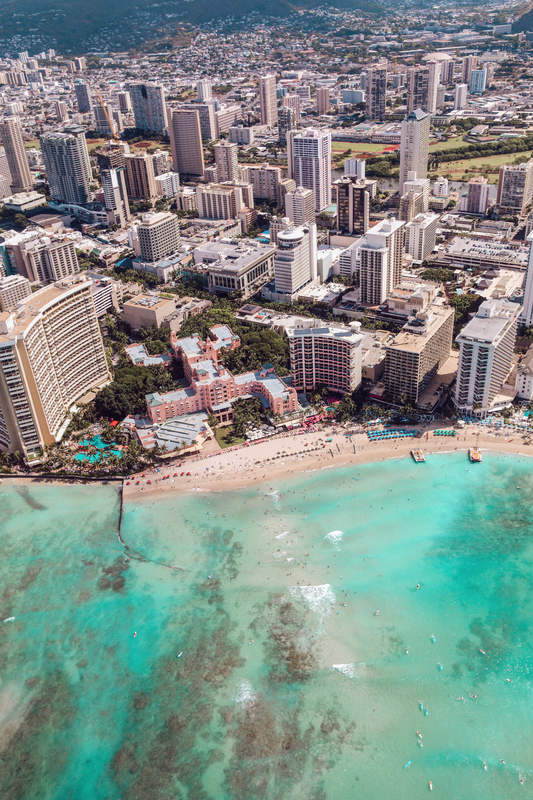 The skyline, all the hotel and restaurant chains… Still, I personally love living in a hotel at the famous Waikiki beach! 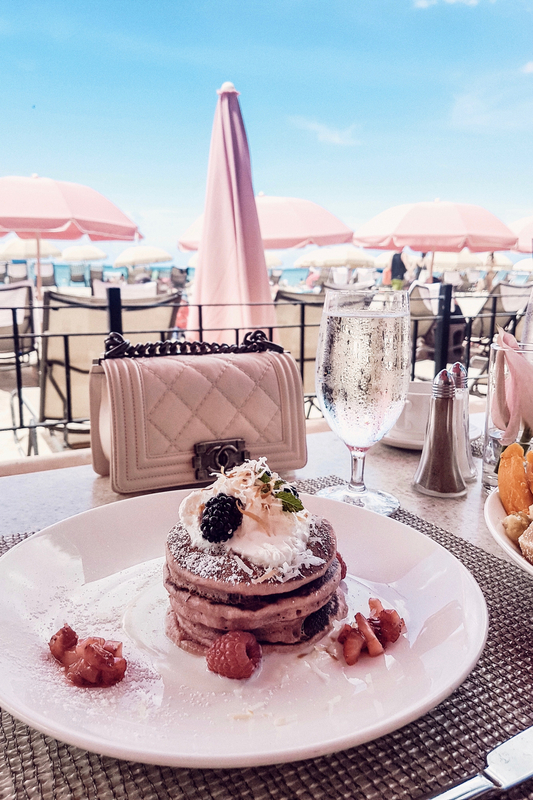 You can start your day at the beach and when it gets too crowded or too hot, you can quickly change in the hotel and head out for a yummy brunch in the city (below you can find lots of delicious food places I can totally recommend!). Also, Alex and I decided to stay in Honolulu because the location is ideal for most trips. In less than one hour you can be almost everywhere on the island! We were also thinking about staying at the North Shore, but a lot of places I wanted to visit were just too far away. Most of the time on Oahu we were staying at The Royal Hawaiian Hotel which is also called the “Pink Palace of the Pacific”. 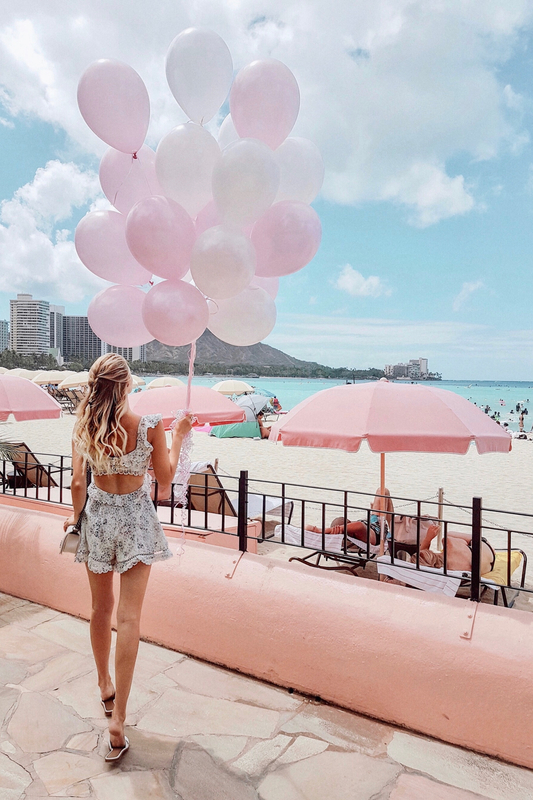 The hotel is very famous on Oahu and as you know how much I love a touch of pink, I felt for the place the moment I saw it. 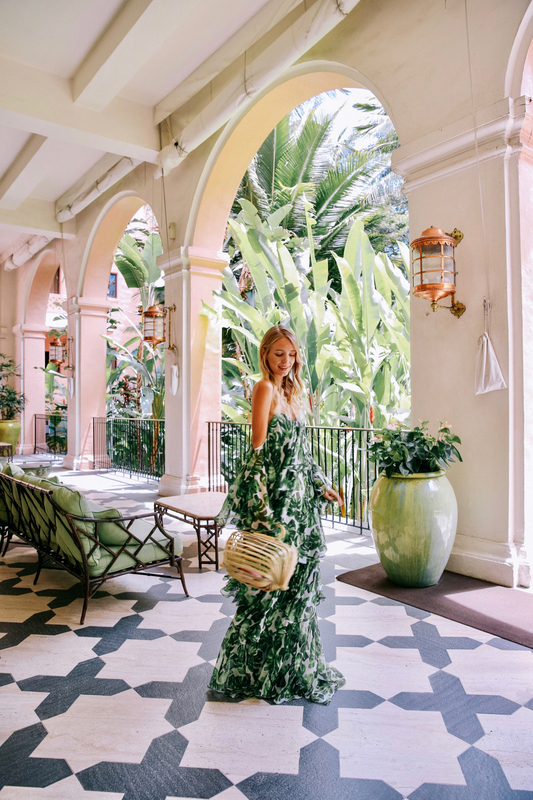 My favorite part of the hotel is a patio with beautiful tiles, cute interior and surrounded by palm trees. You can see more from the hotel: here. The Royal Hawaiian also serves really yummy breakfast, I looooved the pink velvet pancakes! When walking along Waikiki beach, you will easily spot The Royal Hawaiian because not only the building is pink but also the towels and sun umbrellas. For a few nights we were staying at The Moana Surfrider. It’s the oldest hotel on Oahu and I loved the colonial building which was a nice contrast to all the huuuge hotel chains! 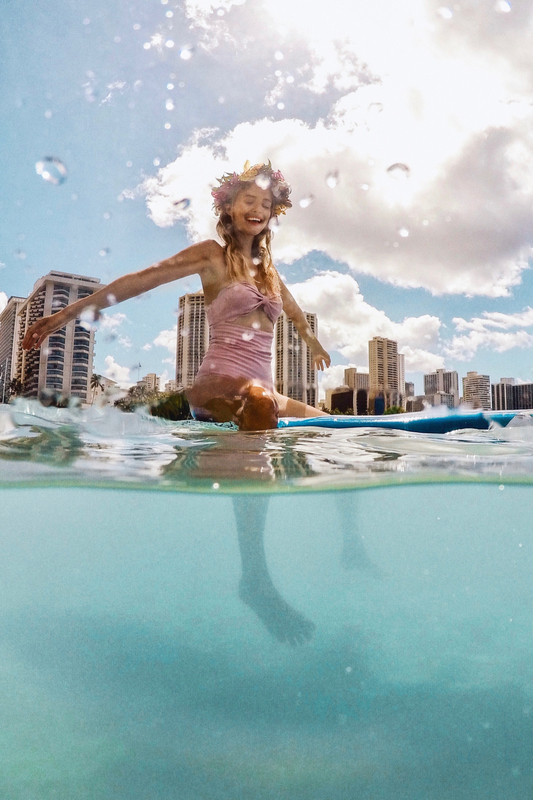 As I did dooo much research to find a nice hotel on Oahu I found a few alternatives which also seem nice: The Modern Honolulu (boutique hotel), The Surfjack Hotel & Swim Club (cutest pool which says “Wish you were here”) & The Laylow, Autograph Collection. 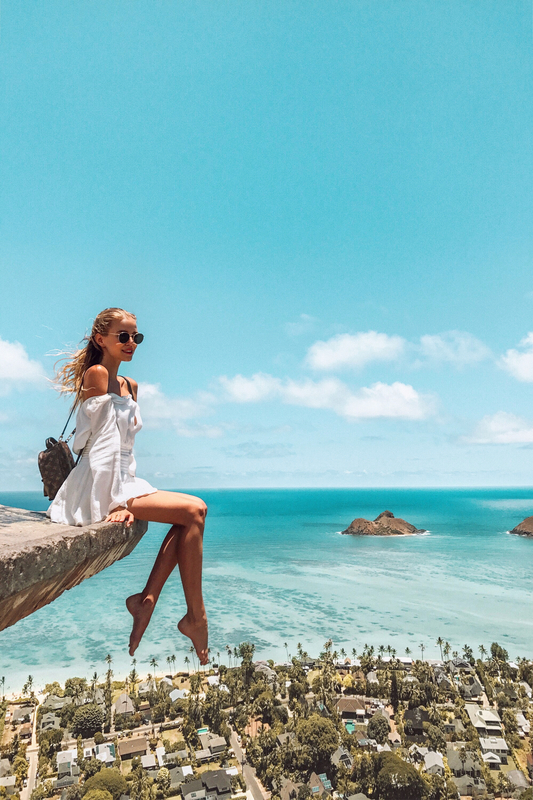 Overall, I have to say that finding the perfect hotel for your Hawaii trip might be the biggest challenge, especially when looking for something a little romantic. 😉 I normally love staying at boutique hotels since I’m very enthusiastic about cute interior, charming details, etc. Even though I love Hawaii, there is not much diversity when it comes to hotels. Most hotels are huuuge and kind of expensive (there are always so many extra costs on top: tax, resort fee, parking, breakfast, sun umbrella…). Hanauma Bay is a nature preserve. Before entering the beach you will have to watch a short video which explains you on how to interact with the nature and how to treat the wildlife, the beautiful corals and animals with respect. The short time invest and an additional fee of about 7$ are totally worth this beautiful bay! It’s one of the most beautiful beaches on the island. 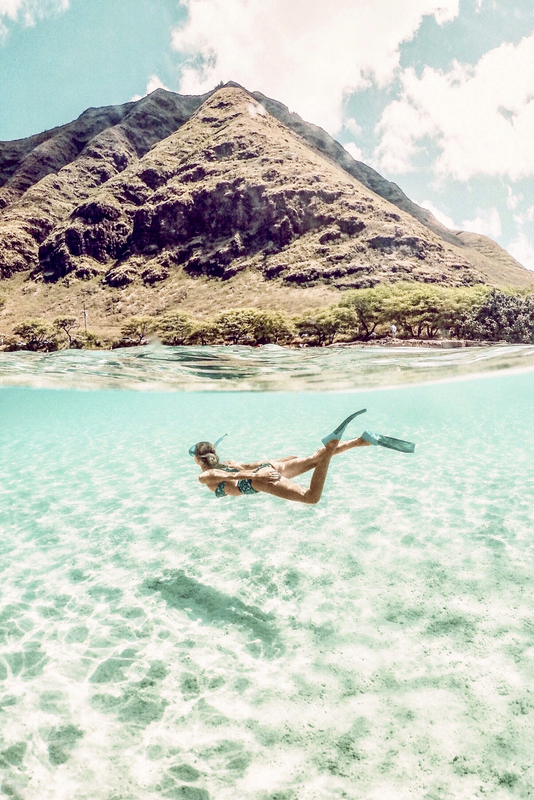 The bay is beautiful, the water clear and turquise and it’s perfect for snorkeling. 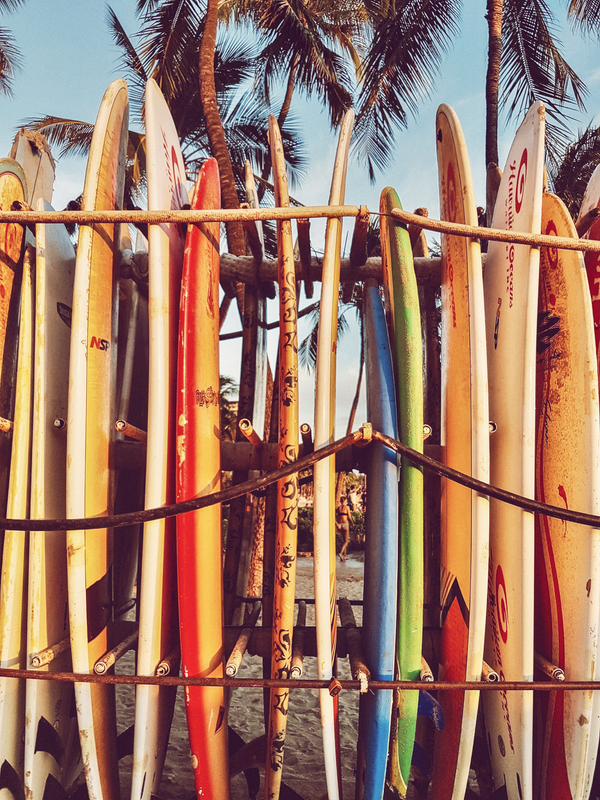 Plus: it’s only 15 minutes away from Honolulu. When driving up the East Coast another beach I visited is Makapu’u beach. The beach is a little wilder and you have natural pools built out of rocks. When we visited it, the waves were quite of a challenge. 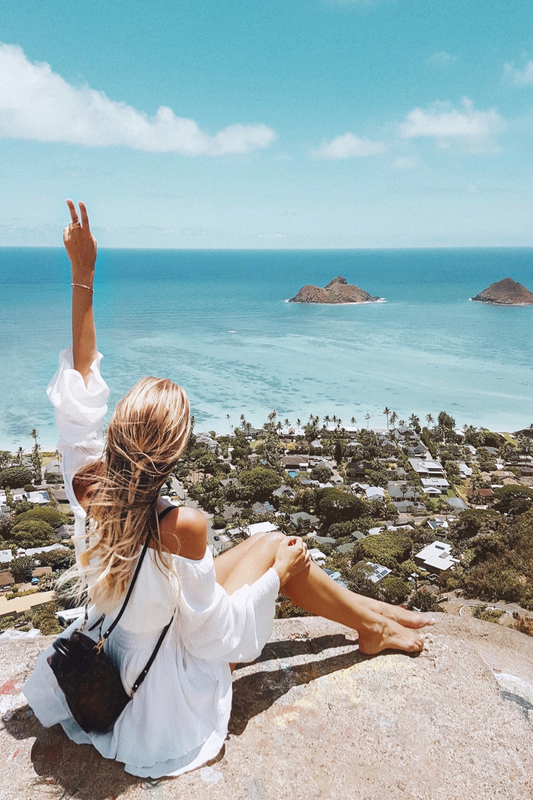 😉 Driving up further North you will get to two of my favorite beaches: Lanikai Beach & Kailua Beach. Kailua beach is very popular but I even love Lanikai a little more. The water is beautiful and with the mountains in the water the views are very scenic. 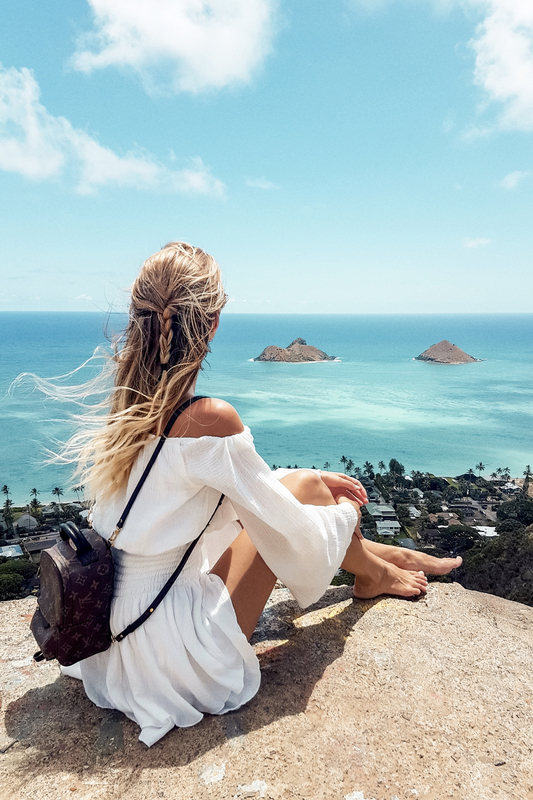 One day we did the Pillbox trail which allows you amazing views on Lanikai See below!). At the famous North shore I can recommend Sunset Beach (for nice sunsets ;)), Turtle Bay (there are ALWAYS turtles but it’s very touristy) and Waimea Bay for cliff jumping OR to watch others jump. I was cliff jumping at Waimea Bay when I visited it for the first time and even though I lost my bikini ;), it was an unforgettable experience! It’s a little trickier to go to the West Coast because there is not too much to do around here and there is also no road connecting the West Coast beaches to the North Shore, BUT that’s the reason why the beaches are still kind of wild and we visited both Electric Beach and Makua Beach because there is a big chance of seeing dolphins. 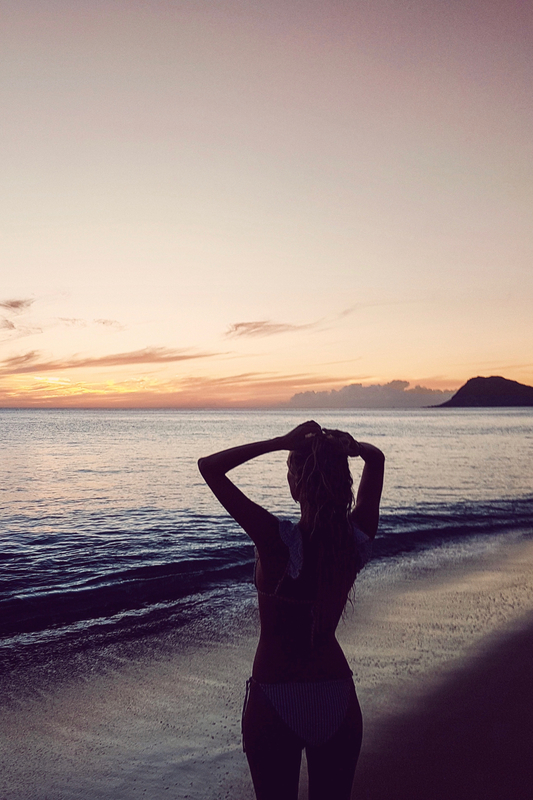 We weren`t lucky, but we saw turtles AND Makua Beach is so beautiful, snorkeling there was one of my best experiences ever! Last but not least: Waikiki Beach! 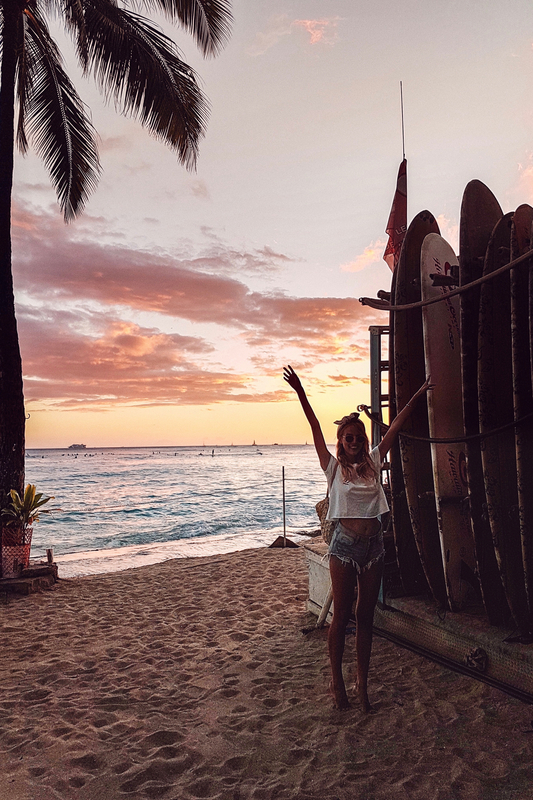 Waikiki Beach is probably the most famous beach on Hawaii as it’s very known for surfing and for being in the heart of Honolulu. 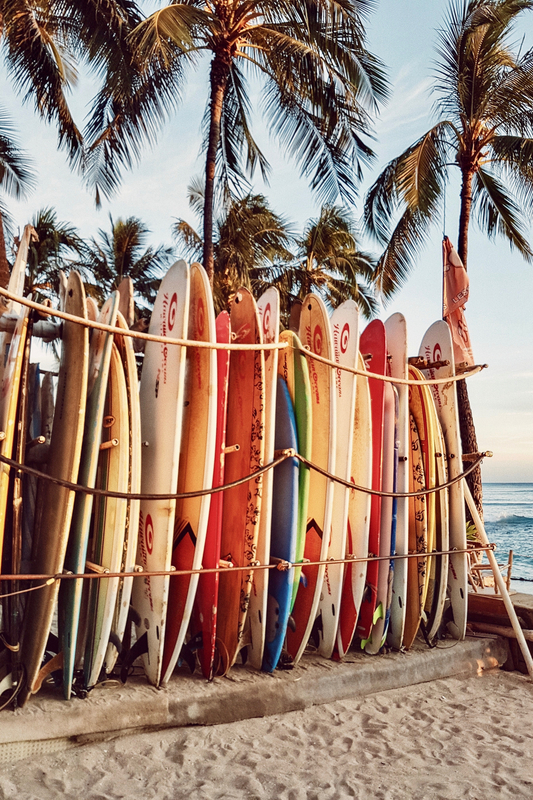 When I visited Hawaii some years ago, I learned surfing at this famous beach and I will never forget this experience! 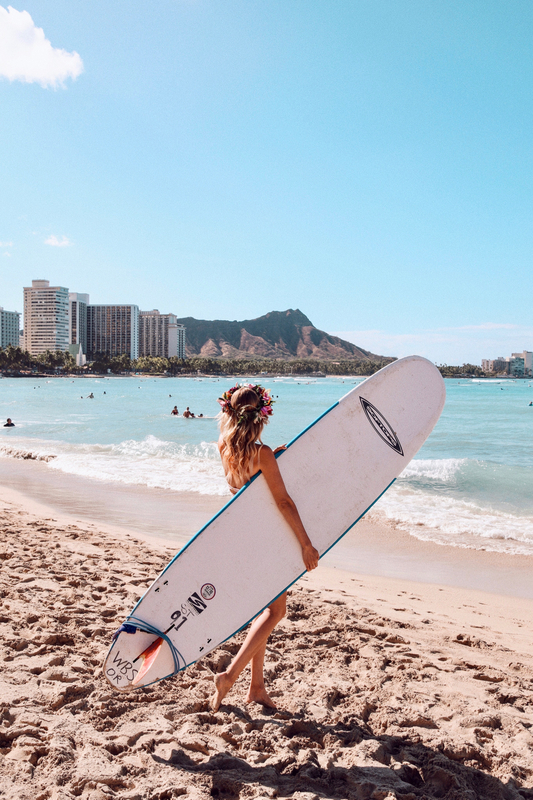 Waikiki is very touristy, still, it’s unusual to have such a beautiful beach in the center of a big city and standing on a board and riding a wave, approaching the big city is so much fun! 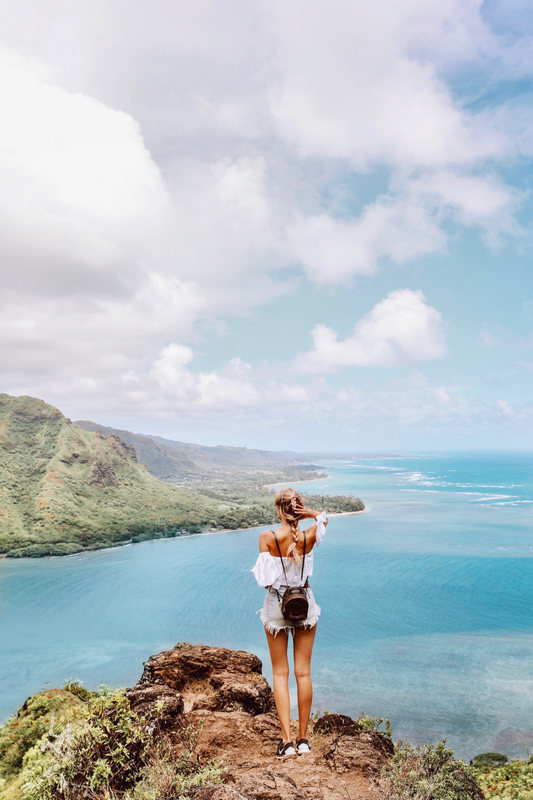 One of my favorite things about Oahu are the breathtaking hikes! Alex and I did the Pillbox trail and the Mini Crouching Lion. 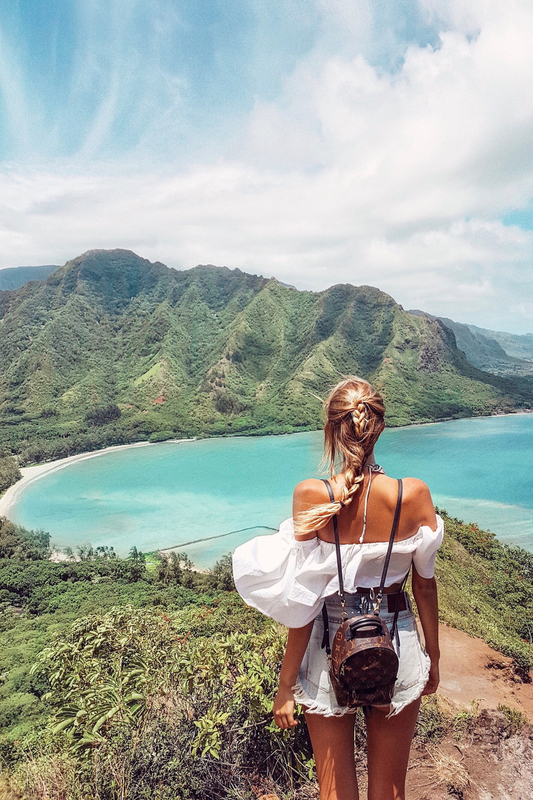 The Pillbox Trail is one of the easiest and most rewarding trails because the hike up is only about 15 minutes and the views are breathtaking. When getting up, you see some boxes which offer different views on Lanikai Beach. We hiked early in the morning and brought some food we had while enjoying the stunning view! The Mini Crouching Lion is a bit trickier. The official Crouching Lion is about 4 miles and as Alex and I are both not super sporty, we decided to do the inoffiziell mini version. As so many of you had questions about this hike, I will post more information in a separate blog post! The hike is a bit trickier and as it’s not an official hike, it’s not always easy to find the right direction. You basically just always go up, sometimes on both hands and feet as it gets quite steep and slippery. I have to say that I’ve always loved climbing and I’m quite an adrenalin junkie, but my boyfriend is a little afraid of heights and for him the hike was quite challenging. When being on top of the mountain, a small path leads you to a rock which is called “The Crouching Lion”. For us it was honestly kind of hard to get there. On top of the mountain it was really windy and the path was very small. Sometimes we got on our knees when the wind got too strong. Still, being on top of the Crouching Lion was one of the most beautiful things I’ve ever seen and I was also a little proud when we finally made it. I tried to be super nice to Alex for the rest of the day, because I know how hard the hike (especially the final meters) must have been for him! 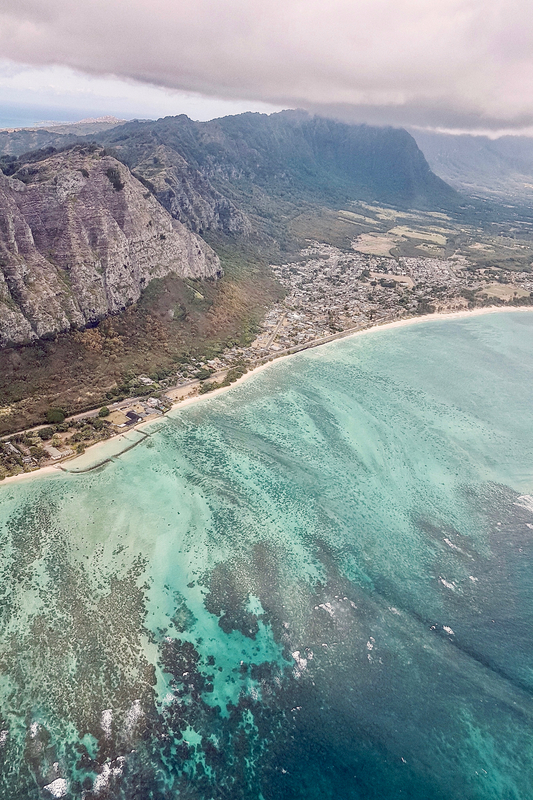 One of the greatest experiences was seeing Oahu from above. As the island is kind of wild, there are many places which can’t easily be accessed. 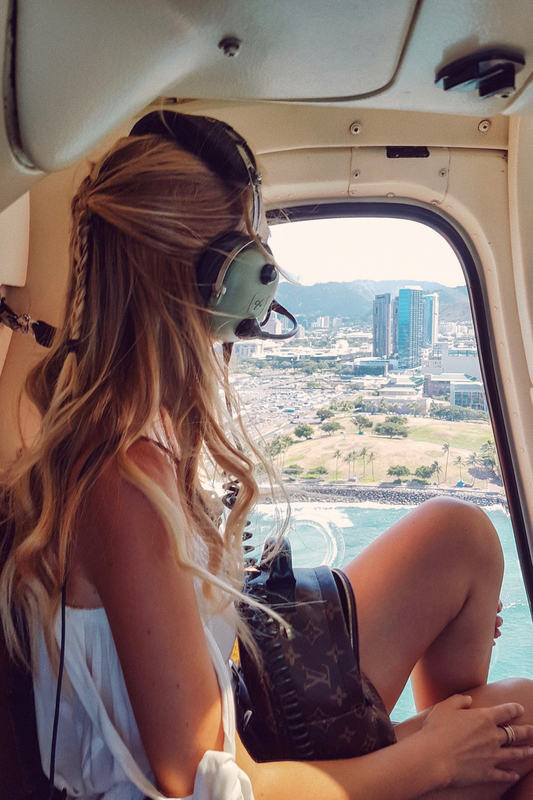 Therefore, Alex and I booked a trip with Paradise Helicopters and had an unforgettable helicopter ride. 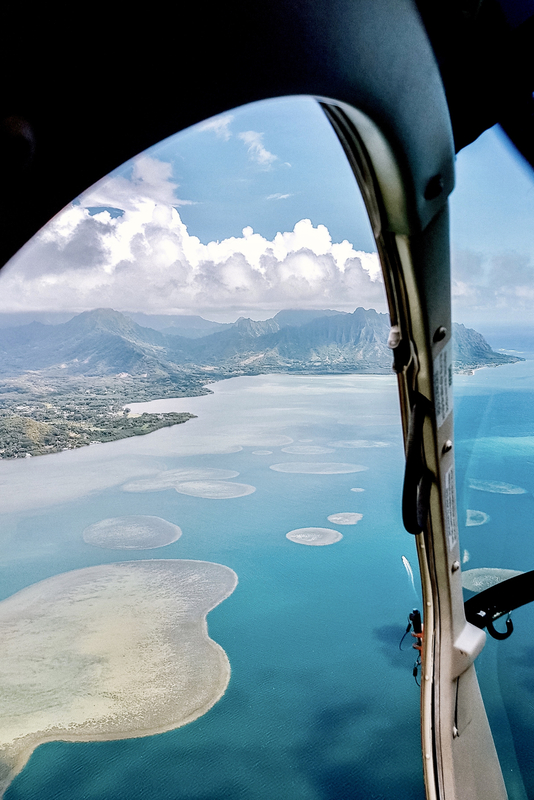 My favorite things were seeing the Kaneohe Bay Sandbar (Maledive vibes! 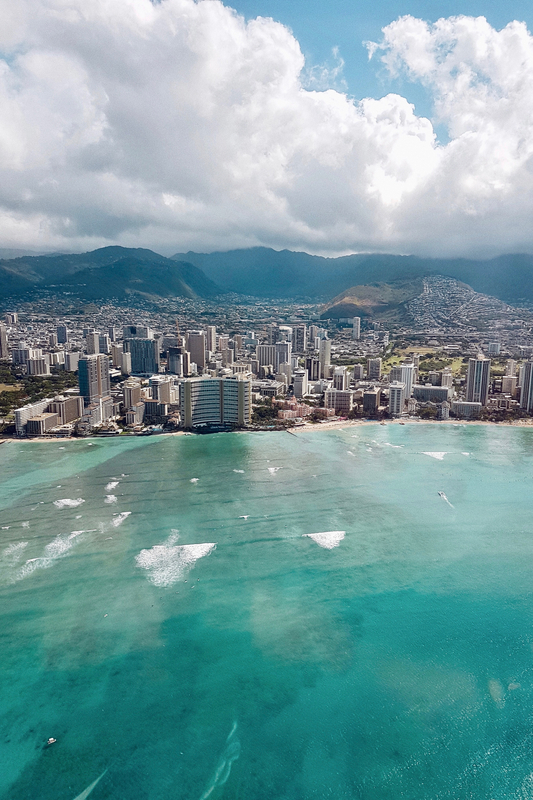 ), the skyline of Oahu and the Diamond Head and some hidden waterfalls from above. 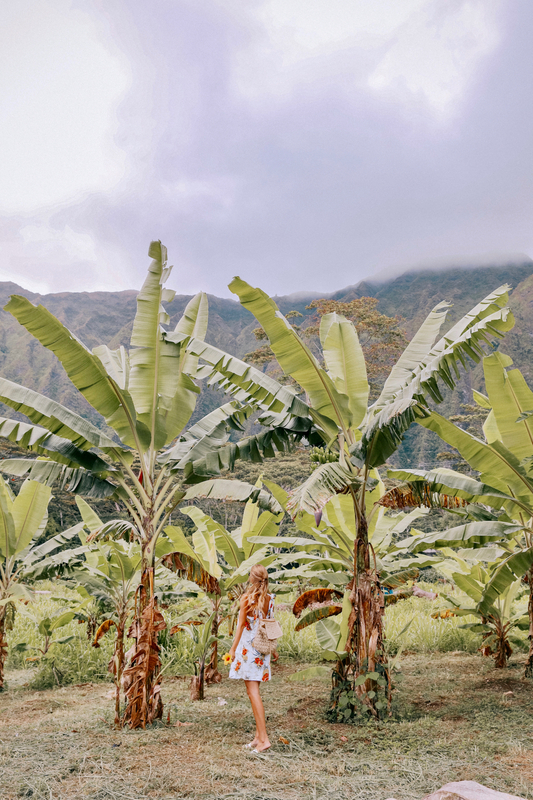 If you’re a fan of Jurassic Park or Lost , you might want to do a tour around the movie place sat Kuona Ranch where they filmed so many movies! As Alex and I love to explore most of the things on our own, we didn’t book a tour but visited the ranch and the beautiful places nearby. I loved the secret island and its beautiful hidden beaches. We had an adventurous day at Ho’omaluhia Botanical Garden, especially because they closed the gates of the garden even though we were still in the park. 😉 The botanic garden is beautiful and you can easily drive through the stunning nature before heading to Kuona Ranch as it’s on the way there. Just make sure to study the opening hours because they won’t warn you before they close the gates. ;P See more pictures: here. 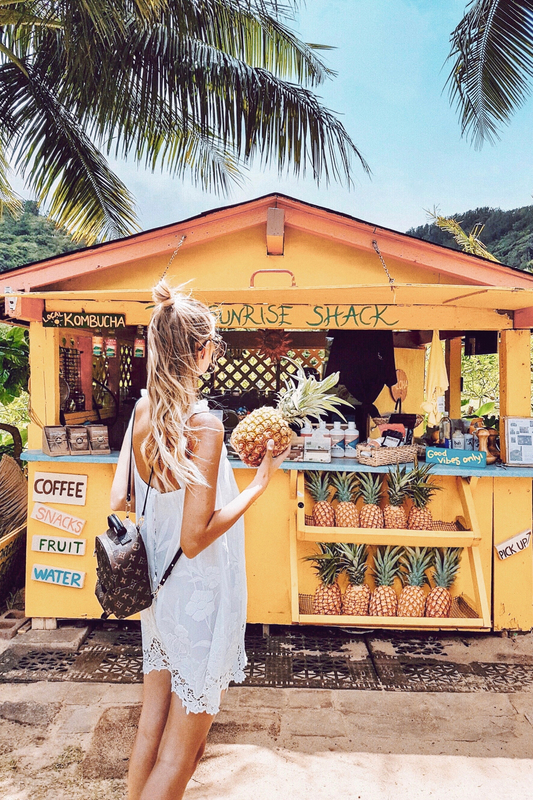 Being a foodie, I made it to Kakaaku on my first day on Oahu when I was looking for the nicest brunch places. Kakaaku is an emerging neighborhood next to China town and you can find so many creative spaces for entrepreneurs, trendy restaurants and colorful murals. THE BEST FOOD ON OAHU? 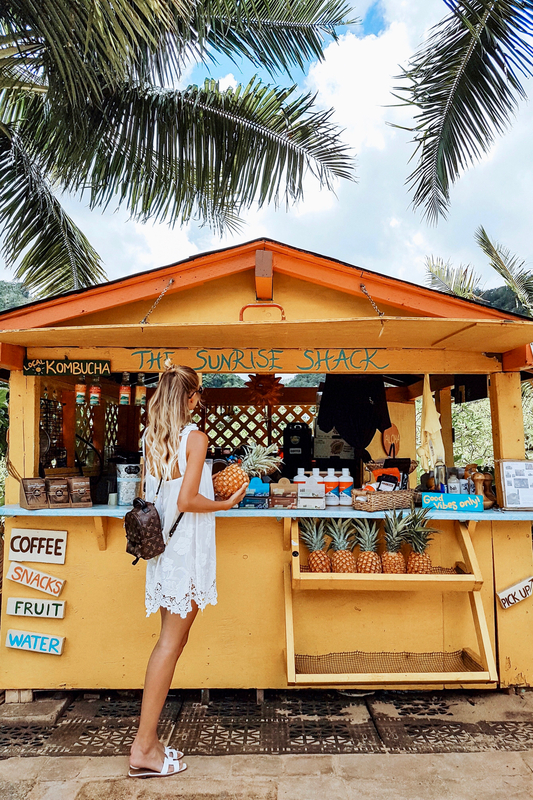 Sunrise Shack: A must when driving up the North Shore! It’s by far my favorite food shack because it’s both super cute and super tasty! We had two papayas filled with peanut butter and toppings and it was sooooo tasty! Island Vintage Café: my biggest surprise! I got totally obsessed with Island Vintage Café! 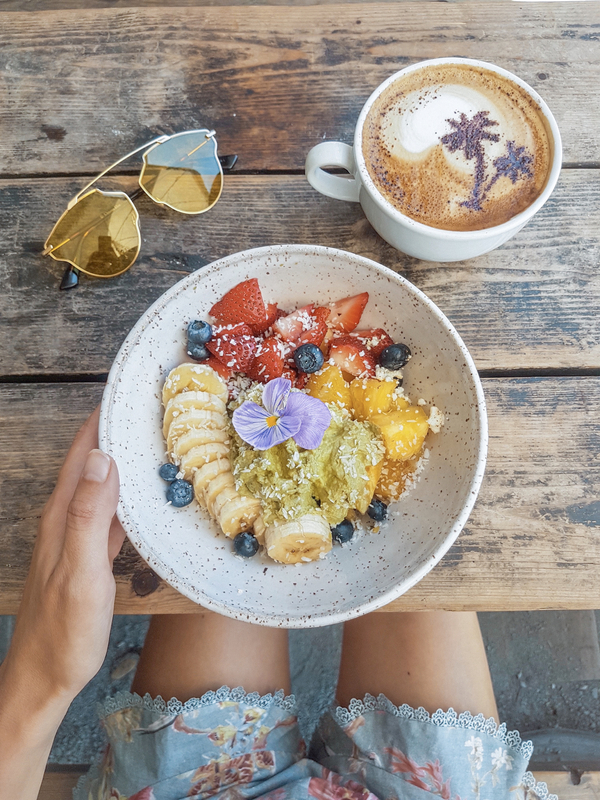 They are a chain and serve super delicious food until 3pm and drinks as well as acai bowls all day long! Alex and I often shared the breakfast plates with extra avocado, cranberry bread and cream cheese! Super yumm! Furthermore, I do love acai bowls with a chocolate flavor and the coca bowl is to die for! I sometimes went to Island Vintage Coffee multiple times per day, but as it’s so good you always have to wait a little! Leahi Health: They have a few restos on the island (luckily!) and they are my favorites for lunch! They have amazing fresh and colorful tacos and I loved the rainbow bowl with lots of avo, kale and a delicious dressing! We were also obsessed with the shakes, especially the one with a chocolate flavour! 🙂 Unfortunately, they close at 5pm almost every day! 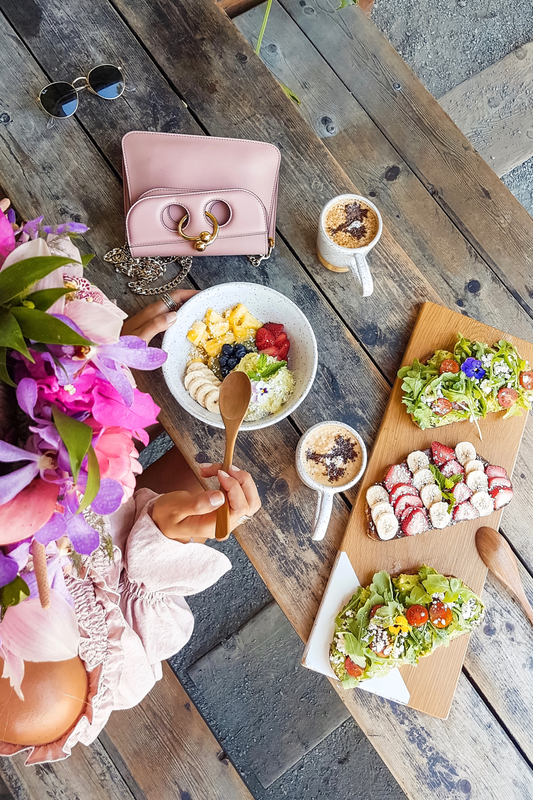 Aroma: One of the cutest spots for a nice breakfast! 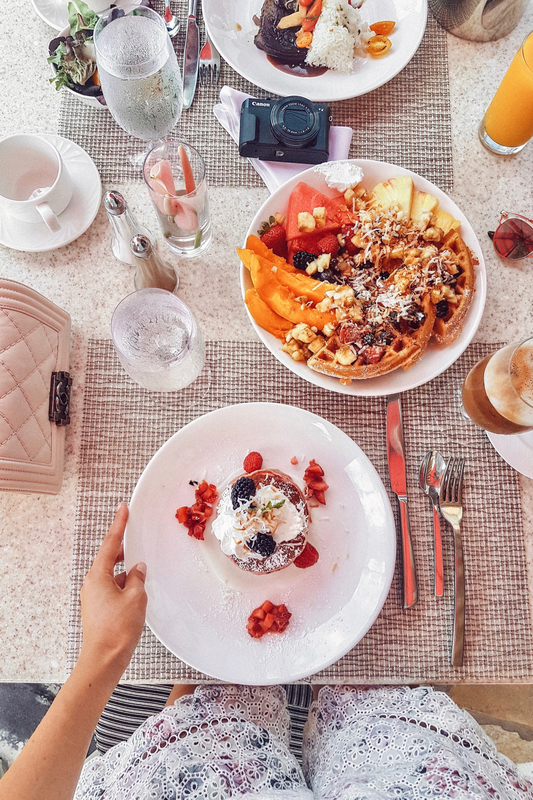 Aroma is located in a mall, BUT the interior is very unique and trendy and they serve all kind of waffles – Even acai waffles! Olive & Oliver: If you have always dreamed about drinking your coffee out of a cup with cute pineapple print: This is your place! 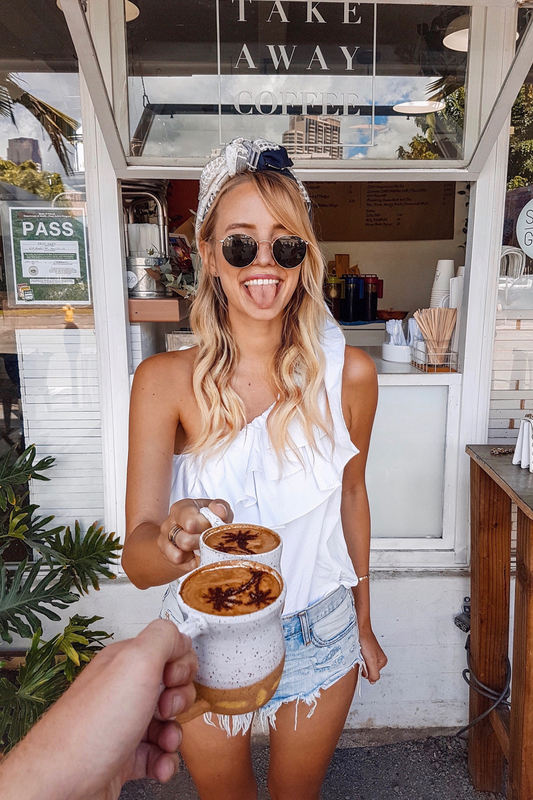 ;P The coffee shop is part of the Surf Lodge hotel and you can also have a quick look because the hotel is a lot of fun! Banán: I found Banán only after a few days, even though they have a few shops on the island and one was next to my hotel! Banán has acai bowls in cups, bowls OR papaya and it’s kind of frozen and looks like a soft ice. It’s super yummyand ever since I discovered them, I had at least one cup (which was only 7$) every day! 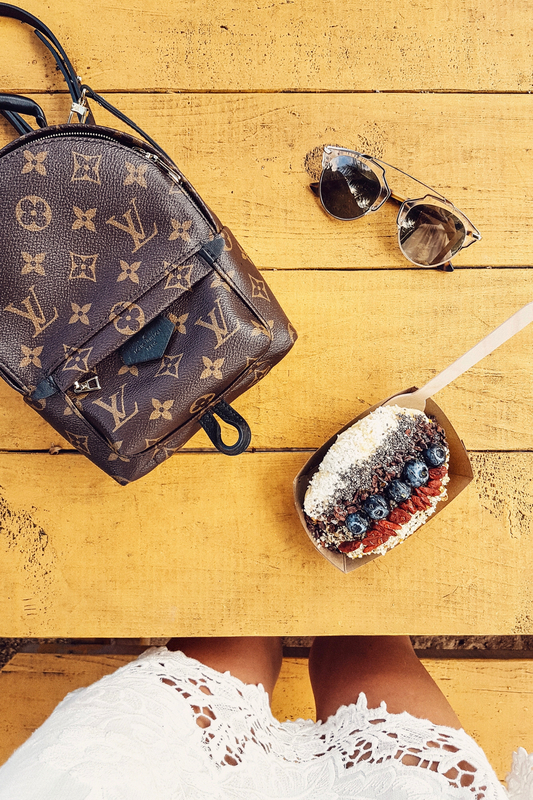 Haleiwa Bowls: I read it’s the best acai bowl on Oahu… As it’s in the heart of the North Shore, it’s super convenient to go here, but as a chocolate lover, I liked other bowls (with more cacoa bits ;)) more! Buho: Another recommendation for dinner! Buho is very specious and you can get a seat in a cool, nicely decorated area or on the terrace with a nice Waikiki view. They serve Mexican food and their salads are very yummy! 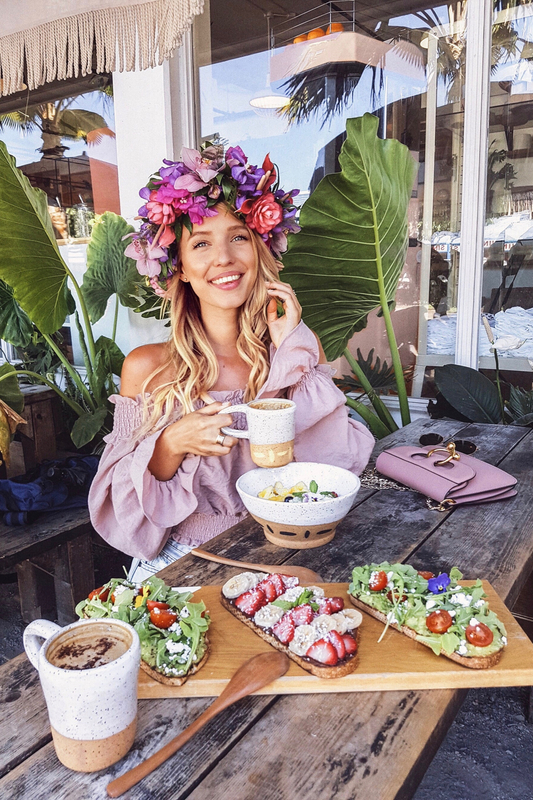 Bevvy Picnic Foods: Beevy is located at the beginning of Waikiki beach and they have healthy food which is ideal to take out and as the name says: for picnic! We sometimes grabbed some items for picnis such as the chia bowl, the veggie sandwich or one of the salads! 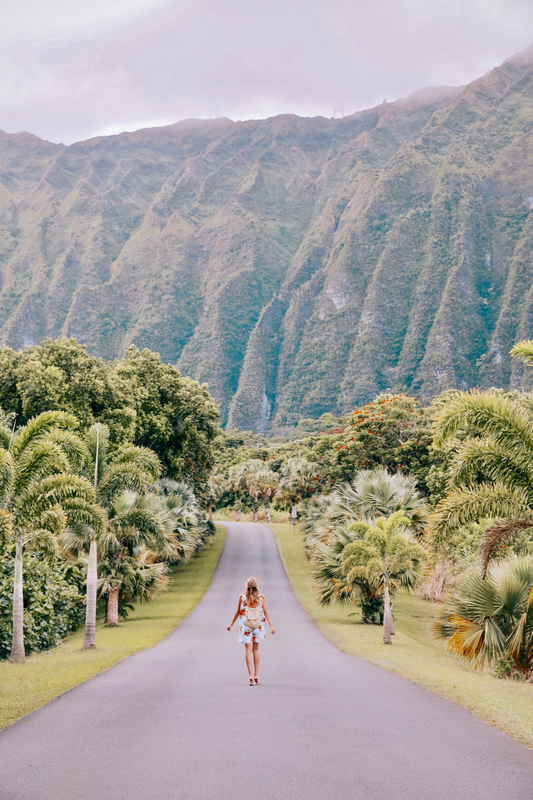 Oh Hawaii… Another dream place I’d love to visit someday! 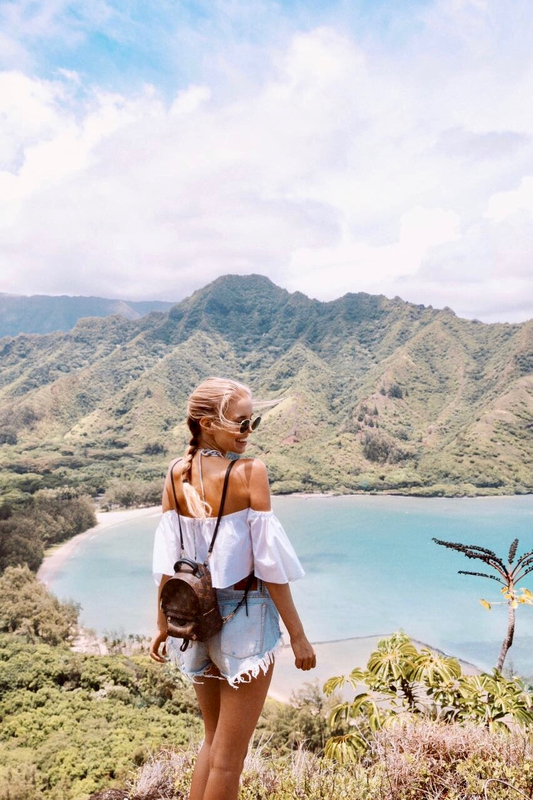 Beautiful photos and in overall such a dreamy trip! Omg! I loved all Your pics!! So beautiful!! Nach deinem Blopost steht Hawaii definitiv ganz oben auf meiner Travel List und ich hoffe so sehr, mein Freund und ich schaffen es nächstes Jahr dorthin. Es sieht einfach so schön aus. Eine tolle Mischung aus Natur und Meer und Strand. Love that dress! So beautiful and flowy. Das sieht alles so unbeschreiblich schön aus! Die Fotos aus dem Helikopter sehen unglaublich aus! What a detailed article ! Thanks babes for sharing all this with us! Wish I could go there one day! As usual your pictures are beautiful! Enjoyed reading this post! 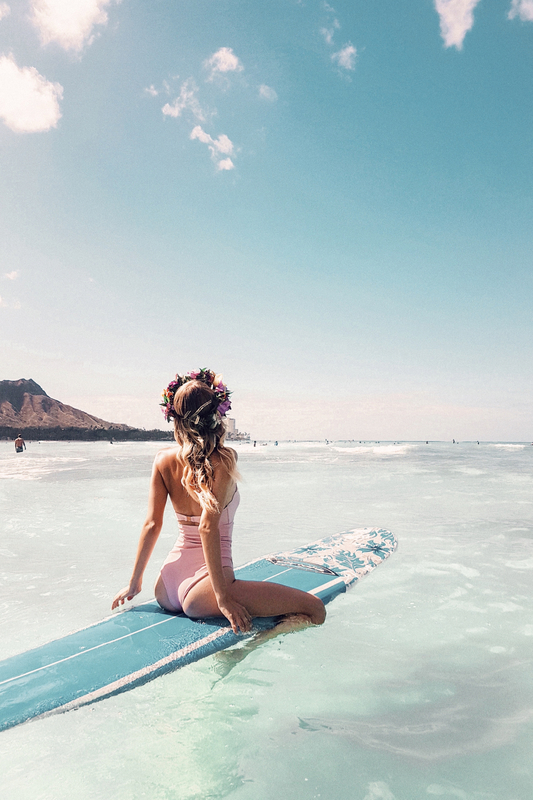 Hawaii looks wonderful and so ‘pastel’! Thanks for the restaurant tips! So beautiful! You are who I aspire to be! Thank you so much for sharing this! 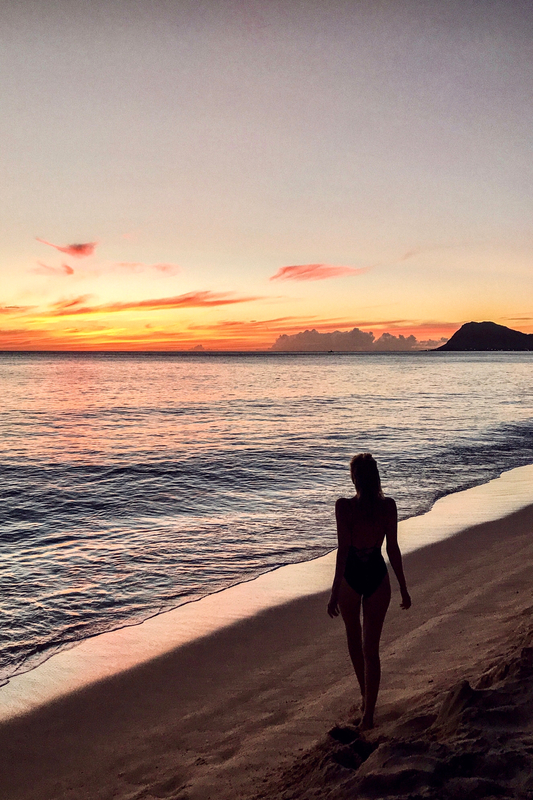 I had just planned a trip to Oahu and couldn’t believe how many different hotels to choose from, places to visit and different places to eat. This is incredibly helpful as we’ll only have a few days there. I’m looking forward to checking out some of these places you mentioned! Hawaii muss einfach traumhaft sein! Steht sicherlich ganz weit oben auf meiner Bucket List! Dann werde ich definitiv auf Deine Tipps zurückkommen! So great! Wonderful as always Leonie! First I want to say that your pictures are amazing. ❤️ But can I ask you how you take the underwater pictures? Hi, first I want to say that I love your IG profile. You’re pictures are amazing. Can I ask you how you took the half underwater picture? Leonie your pictures are always so, so stunning! I’ve always wanted to visit Hawaii, but even more so now! I love all of your photos, I was curious what type of camera you use for your pictures! I love your pictures! I was wondering what type of camera you use for your photos. Wonderful ! Thank you, Madam ! Royal Hawaiian Style !